Our light weight modular campervan conversion on the Mercedes Benz Metris offers comfort and practicality. The SCA pop up roof and the flooring system are crash tested after US standards. We are very proud to introduce the brand Terracamper to the North American market. Engineered and designed in Germany - Terracamper is a one of a kind van conversion. 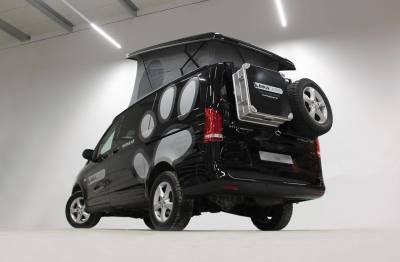 With our modular furniture system you can convert your van from your every day driver to your campervan in minutes. The Tecamp sleeps four adults comfortably. We are also very proud to announce that our products are all crash tested to United States standards so you and your loved ones are always safe during your travels.